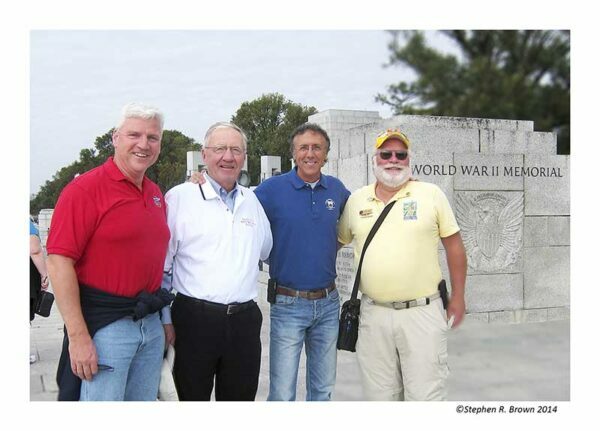 Jeff Miller and Earl Morse, co- founders of Honor Flight Network at the WWII Memorial with Rolland Kidder of Frtiends of the WWII Memorial and George Kerestes of the National Park Service Volunteers. BIG NEWS: Once again our co-founders Earl Morse and Jeff Miller are receiving much deserved recognition. Everyone knows the amount of time and effort they have spent on Honor Flight and I have had the privilege to be a spectator. This year, the Honor Flight Network will have flown over 150,000 veterans to the WWII Memorial. As a publisher with a book on the WWII Memorial, I tried to get the book out through any number of government agencies but private action seems to be the most effective and so Honor Flight has probably given away some 70000 book to their intended audience, WWII Veterans. I am honored to have all of you as friends and think it’s great that Jeff and Earl have gotten this honor. “Saturday will be the first time he has ever been on the same stage with honorees whose names are known instantly across America and even worldwide. Miller, the Hendersonville native who cofounded the Honor Flight Network with Air Force veteran Earl Morse of Ohio, will join former President Bill Clinton, “the Greatest” — Muhammad Ali — football star Kurt Warner, actress Jane Seymour and former Congresswoman Gabby Giffords and her husband, astronaut Mark Kelly, as 2014 Caring Award winners on Saturday in Scottsdale, Ariz. Bob Dole and Tom Daschle, co-chairs of the Caring Institute, announced the 2014 Caring Award winners. The awards will go to 10 adults and six young people who have made extraordinary and lasting efforts that benefit society. They will be recognized at the Caring Awards Ceremony at the Omni Montelucia Resort and inducted into the Caring Hall of Fame. “We are honored to celebrate these extraordinary people who have used their lives for the benefit of others,” said former Sen. Dole. “These persons honor us all by the quality of their lives, so it is highly appropriate that we honor them and hold them up as role models to be emulated by all,” added former Sen. Daschle. October 14, 2014 | Filed under About the Book, Blogs, Honor Flight, WWII Memorial and tagged with Current Affairs, DC PHOTO BOOK, Honor Flight, Jewel of the Mall, National Park, photography, Senator Dole, Travel, Washington, WWII Memorial.